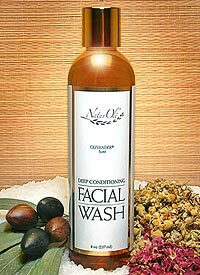 EWG scientists reviewed NaturOli Deep Conditioning Facial Wash, Olivander (2014 formulation) for safety according to the methodology outlined in our Skin Deep Cosmetics Database. We assess the ingredients listed on the labels of personal care products based on data in toxicity and regulatory databases, government and health agency assessments and the open scientific literature. EWG's rating for NaturOli Deep Conditioning Facial Wash, Olivander (2014 formulation) is 1. Purified Water, Olea europaea (Olive) Leaf Extract, Rosa damascena (Rose) Extract, Calendula officinalis (Marigold) Extract, Melissa officinalis (Lemon Balm) Extract, Saponified oils of Olea europaea (Olive) and Cocos nucifera (Coconut), Vegetable Glycerin, Jojoba Oil, Citrus nobilis (Mandarin Orange) Oil, Lavandula angustifolia (Lavender) Essential Oil, Anthemis nobilis (Chamomile) Essential Oil. Apply on wet hands, work into a light lather on facial areas. Rinse well. Moisturize after use if desired.